FM and I went out last night. He was meeting his college friends because one of them was in the country. I was a nervous wreck at first because apparently, they like being spontaneous and do not make plans ahead of time. I, on the other hand, always have a plan. I opted to wear something basic. A black top, jeans, and wedge. Thankfully, his friends also wore something similar so I did not feel overdressed nor under-dressed. We ended up at Little Asia in Venice Piazza. We ordered a lot of food and ended up taking home 1/4 of it. I'll post a food entry on the food separately. Throughout dinner, conversation was free flowing. What I liked about the conversation was that from time to time, they'd ask me things or I'd get to share some insights. I did not feel out of place. FM also ensured that I was always comfortable and part of the conversation. I appreciated that. The Venetian Market was in full swing when we left the restaurant and since they were wine drinkers, we checked out the place and they bought a bottle of wine to consume after dinner. I had fun talking to these ladies. They were gorgeous, sensible, and very down to earth. I completely understand why FM are friends with them. I'm glad that they are a part of his life and that hopefully, in time, they will be part of mine as well. Everyone was talking about the Avengers. Honestly, I had no intention of watching it but FM and the kids were going to watch and he invited me to go along. I said yes to spend some time with his kids and of course, with him. We watched it in 3D. It was so cool. Hahaha. I laughed a lot during this movie. It was funny and it was hilarious. To date, there are still two scenes that when I remember, I still laugh out loud. After, we had dinner at Jade Palace. It was a first for me and I was wary since it was a Chinese restaurant and I have high expectations when it comes to Chinese food. The hakao was pretty awesome. It wasn't dry and it was tasty. The spinach soup was LOVE. It was so good, I had 4 cups. Seriously. It was really, really good. The assorted platter was big too. I think I used most of it as viand for the yang chow. Here we are, all ready to feast on the food being served. I love dinner outs like this. Good food and great company = happy times. Everyone has been raving about the blackout cake of Poco Deli. I have read about it on the numerous blogs and in reviews on different magazines. Everyone keeps saying that it was delicious, rich, and really good. Of course, the chocoholic in me started craving for it. FM got me one the other day. He saw that I was tired and wasn't feeling well (this was the same day that I got mugged) so he got me a slice of this cake. I was really excited to try it. I had it all prepped up and because FM is such a supportive boyfriend, he even made sure that I'd get a good shot of this slice of cake. See above photo. I got my fork, cut into the cake, and took my first bite. It was chocolatey, crunchy, and it was YUCK! I'm sorry but it was really YUCK! The taste wasn't good in my opinion and it was really disturbing, the amount of crunchies that was on top of the cake. Mind you, I love my mini chocolate kisses but this one just didn't mesh well. It was dry and it felt like the slice I had was a week old. It was really, really disappointing. See photo below that was taken after two bites of the blackout chocolate cake of Poco Deli. I was really sad. It was a good thing that earlier that day, I had this. 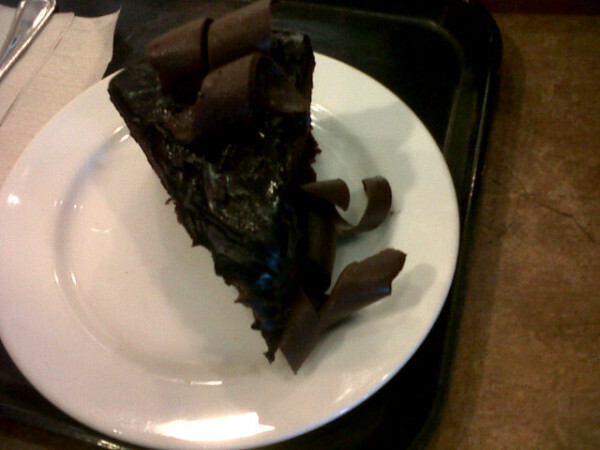 This is chocolate cake from Starbucks and this one, is LOVE! OMG! I actually know the guy in the video. I just didn't know he was this funny and crazy! I could relate to at least half of what he showed. If you have ever gone through a break up, WATCH THIS! You'd cringe, laugh, reminisce, and feel happy that you have finally MOVED ON! I was having a pretty bad day. We just got back from Divisoria and I did not have enough sleep. It was hot, I was sweaty, I was sleepy, and I needed a shower badly. He had been hinting of a surprise the entire day. I was curious but I did not want to expect much. Also, I had no idea what he had been hinting about. He just said that it was something that I'd immediately blog about. I told him it was not possible since I had over 30+ backlogs for my blog. He smiled. I didn't. Again, I was not in a good mood. We were in his room with R watching the finale of Glee and I noticed that he kept going out of the room. I didn't take heed because I was busy watching. I'm like that. I don't like being disturbed when I am watching a show that I like. While Kurt was wrapping up his performance of "I'll Remember" by Madonna, he asked me to look at a photo on his laptop. I was mildly irritated to be honest. Still, I looked and saw that it was a photo of the Starbucks Mug Brasil. He asked me if that was the right design for the Brasil mug. I said yes. He asked if it was pretty or if I liked it. I said yes, it was nice. Then he asked me if the mug in the picture looked exactly like the one behind the screen of the laptop and then he pushed the monitor of the laptop down and there it was, an actual Brasil mug. I was ecstatic. I couldn't believe he was able to get me Brasil. I think I semi-jumped from my seat and hugged him. I was so happy. I was just really grateful that he made an effort to get me a Brasil mug. I had lost all hopes of getting a Brasil mug because, face it, who goes to Brasil for vacation? Almost no one I know. I was still reeling from the shock of this surprise when he asked me about Guangzhou. I told him it was easier to get compared to Brasil but still not that easy since it is a province of China and not a city in China. He then asked me to turn around and there was a Starbucks Citymug box lying on the bed behind me. He got me a Guangzhou mug. It did not end there. He showed me a picture of Foshan and there it was, sitting on the other side of the bed, waiting for me to give it proper love and care. Eeeekkk! 3 new mugs were given to me by FM and I didn't have a clue. It was truly a surprise. He was really able to surprise me and I loved it. I loved that moment. I thought it was over. I was ready to settle down and watch Glee again when he asked R to give me something. She handed me a white box and voila, inside, was a Macau mug. O-M-G! Apparently, he went out the night before simply to get me mugs. I am such a lucky girl. My new mugs. Thank you FM for this wonderful surprise. You were right, I would blog about it asap. I was definitely in a good mood after this. I've been wanting to try this place since last year when I had another epic fail moment of organizing a meet up and everyone went except me. So, a couple of weeks ago, FM invited me to a dinner out with his kids and some friends. This is where we went. I loved the jukebox. If there was one thing that I fell in love with at that place, it was the jukebox. We ordered the philly cheese steak sandwich and the burger. It was ENORMOUS. Scratch that! It was GINORMOUS. It was crazy how big it was because in the menu, it looked normal. It was one of those reversal moments where normally it looks big on the photo but average in real life ... this time, it looked normal size on the photo but it was larger than life. The taste was pretty okay for me. Johnny Rocketts for me is more of the experience rather than the actual steak sandwich and burger. It was a good thing FM was with me. Afterwards, we had us some dairy queen. FUN! It was the day of my first interview. Yes, you read that right. It was my first job interview after 2 years of not even thinking of getting one. My resume was not updated and it was a disaster, or so says FM. Regardless, I went and I conquered. It was a good thing that I did because FM and the kids were there. When I say the kids, we all know by now that it would be R, V, K, and B. Wow! That was quite a mouthful if I may say so. We ate at Sumo Sam because FM is sweet that way. He chooses places we'd eat at based on the fact that I have not eaten there. See, new resto = new blog entry. He's supportive that way. :) I love it! While ordering or deciding rather on what to get, we took turns posing for my camera. Finally, we were able to order food. B ordered the shrimp popcorn which turned out to be the big hit of the day. Everyone grabbed one and eventually, it was gone. K and V made the mistake of ordering one gyudon each which turned out to be good for 2-3 kids. V finished his and K, K had it taken home and ended up leaving it in FM's car. I don't know what happened to it afterwards. I ordered this thinking that it was a small plate. Yes, it was small. No one bothered to tell me it was also very deep; hence, there were a lot of rice. A LOT! Here we are, the happy bunch. And here they are, the tired bunch. LOL. Yes, my face is that small. Haha. I wasn't supposed to watch this movie. It was not on my list nor even anywhere near my radar. It was a movie that could have passed by and I wouldn't have felt lacking if I hadn't seen it. However, FM watched The Lucky One with me and so I gave in and watched Battleship with him. Boy, what a good laugh I had out of this guy-flick movie. But first, we had dinner. I decided on having dinner at Oodys because Oodys is a fail safe place for Thai food. It's not too expensive but its delicious. I don't say really good but it's not bad. It's safe. It delivers what needs to be delivered on a rainy day. The spring roll was crunchy and fresh. It was actually too little because it was gone in less than 10 minutes. It was that good. The pad thai was a classic. It wasn't as good as the one in Mango Bistro but it was pretty good. As for the bagoong rice, this was a win for me. It was just right. I loved how it was cooked and if I could have had my way, I would have eaten another cup all by myself. They enjoyed the food and it was a great meal that we had. I didn't feel awkward with FM's kids and hopefully, they felt the same. It was the first time I was going out with the 3 of them. I was a wee bit nervous and I was apprehensive that the kids might feel that I was being intrusive. Luckily, all of my worries were for nothing. We watched the movie and the boys were all excited. R and I on the other hand just found the movie amusing. It had "moments" between men that I thought were not right. Come on! World war is waging and you get a couple of guys having a "moment?" Seriously? Hahahaha! After the movie, we went to get our milk tea addiction fixed. It was a good thing that Serenitea had a branch near the movie house. We trooped over and ordered. The night turned out to be a good one and I'm really happy that I agreed to watch it with them. I look forward to many more movie nights with them ... hopefully, with B in tow next time. We agreed to not celebrate monthsaries. We both believe that its the anniversary that matters and we should not count the months. It just so happened that on the 1 month mark of our relationship, there was an event that we were invited to and it was at Circles Shangri-la. We were pretty busy because of the event but fortunately we were able to sneak in some quality time together and after some incidents, we finally got around to enjoying the buffet. After dinner, as we were waiting for the driver to pick us up, we had our shot in front of the centerpiece of the hotel lobby. It may have been at a posh hotel but what made the night truly memorable was that I was with someone who loves me and cares for me the way I deserve to be loved and cared for. It was the day of my first interview after working at my current job for more than 2 years. I was a nervous wreck and FM treated me to lunch afterwards since my interview was at 11am. I ordered chicken and he ordered pesto. They were both pretty good but since I cannot remember for the life of me what they actually tasted now, it must have been not that good. I did have fun with FM on this date because I felt that he supported me. He made me feel and believe that I could pass the interview. He restored my faith in myself as a sales person and as a professional. I thank him for his belief in me. He doesn't just love me, he believes in me. For me, that is as sweet as this dessert in the last photo. This post is long overdue. FM has been keeping me pretty busy these past few weeks and life has been cooperating with him completely. It's all good though but I did miss being able to blog daily. However, the upside is that since a lot of things has been happening, I now have over 20 blog entries waiting to be written and posted. GAH! We were at Shangri-la sometime ago and FM wanted to eat at the food court. We were standing around in the middle of the place when I saw this sign. I've always liked bagnet and so it was such joy to see this sign. I immediately ordered the kare-kare bagnet and I really liked it. It was straightforward and without pretense. It was really good in my opinion. However, 8065 is still better in my opinion. I would give this a shot again though. If I have a craving for bagnet, this would be a possible go to place for me.